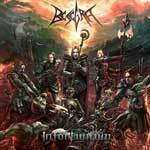 Besegra are a death/thrash metal band from Canada formed in 2009. Opening this E.P. is 'Master Of Attrition', a kind of Megadeth meets Slayer feel to it, slow and heavy with death metal growl-like vocals, superb guitar riffs and a near acoustic solo mid song. 'Blood Lust' is an up tempo hard rock song full of pace and power, that will bang the head instantly. A superb foot tapping intro to 'The Beast Submits' quickly changes into another up tempo song with 'Open Arms' rattling along at pace with some great riffs. 'Division' is an epic song, full of atmosphere, from the short doom laden intro, to the rattle of thrash metal as it storms to a mid song acoustic solo, before the pace is upped and the song races to a furious finish. The catchy 'This Is What Killers Are Made Of' closes the E.P. in fine style. Overall, great riffs, great vocals and superb song structure, making this E.P. a collection of power and pace, yet catchy heavy metal.